Ringneck Snakes take their name from the distinct colored band that wraps around the neck of most individuals. The snakes pictured here were photographed in Allegany County, New York. They are part of the Northern Ringneck Snake subspecies, Diadophis punctatus edwardsii. The neck band and belly of the Northern Ringneck Snake is typically a pale yellow, and the scales on the snakes' back is typically light gray. However, the colors of the neck band, belly, and back of Ringneck Snakes varies substantially across their broad geographic range. For example, the Pacific Ringneck Snakes (Diadophis punctatus amabilis) from California has a dark orange neck band and belly coloration. 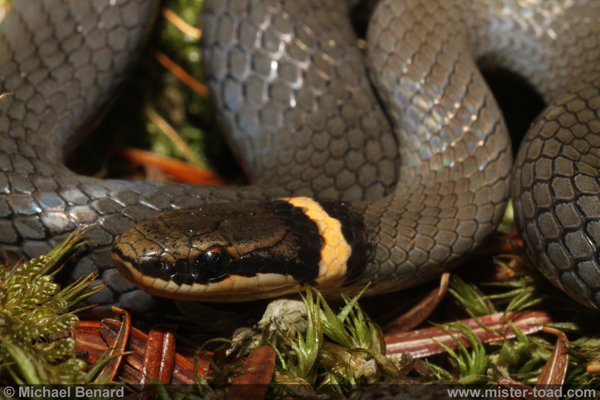 Some fascinating insights about the natural history of Northern Ringneck Snakes comes from Frank Blanchard, Ruth Gilreath and Frieda Blanchard's long-term study of these snakes in Michigan. For example, they found that Ringneck Snakes had a strong preference for red-backed salamanders. Redback Salamanders were the only prey item that wild Ringneck snakes regurgitated after capture, suggesting that Redback Salamanders were the snakes' most common prey. They also tried feeding different types of prey to captive Ringneck Snakes. The ringnecks refused a wide range of prey items that included frogs, grasshoppers, beetles and centipedes. The snakes did eat earthworms as well as hatchling snakes and lizards. However, even in captivity the Ringneck Snakes still preferred Redback Salamanders. I found the Ringneck Snakes pictured here under a rock right at the transition zone where forest changed into an open field. 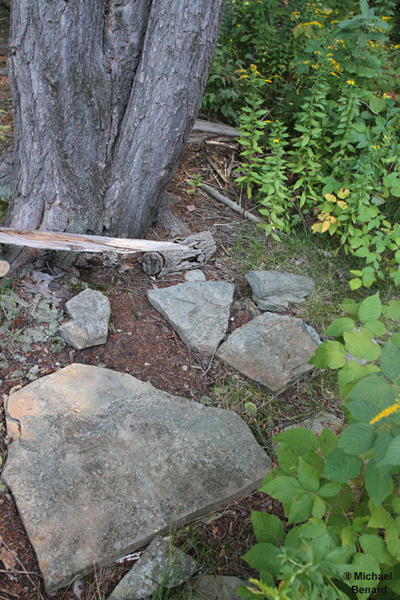 I also found several red-bellied snakes under these rocks at the same time. I have visited this site for many years, and frequently have seen both Ringneck Snakes and Red Bellied snakes under the rocks. The co-occurrence of these two snakes is particularly interesting because the adult Ringneck Snakes will consume young red-bellied snakes.